New York motorcyclists all face certain risks and legal issues, whether they’ve just received their motorcycle license or are experienced riders. Understand these important risks and rules faced by bikers to maintain your own safety and that of any passengers. If you have been hurt in an accident, contact a knowledgeable Hudson Valley motorcycle accident lawyer as soon as possible to explore your right to recovery. Motorcyclists face different safety concerns than do drivers of passenger vehicles. In order to keep riders safe, New York motorcyclists must possess certain equipment under the law. For instance, riders must use protective eyewear while on the road. In addition, motorcycles must have a second seat and footrests installed in order to transport passengers. Also, bikers must keep their headlight on during the day to increase their visibility. While motorcycles make up only 2% of all vehicles on the road, riders comprise about 9% of all those fatally injured in accidents. Approximately 90% of all those killed in motorcycle accidents annually are male, and 30% are under 30 years of age. 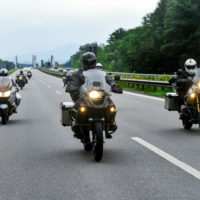 Since motorcycles lack the stability of passenger vehicles, they are more likely to be forced off the road due to the actions of another driver, or by poor road conditions. About 40% of all fatal motorcycle crashes are single-vehicle accidents. Even if a crash involved only the injured motorcyclist, the crash victim may still have a legal claim for their damages, such as against a local government for failing to maintain the road in a safe condition, or against a defective vehicle or accessory manufacturer. Helmet use is mandatory for all motorcyclists in New York. Helmets have been shown to be 67% effective in preventing head injuries, which are the number one cause of death among motorcycle riders. Overall, helmets are 37% effective in preventing all fatal injuries. Most New York drivers are protected by New York’s no-fault insurance, which provides benefits to cover property damage and medical expenses to all covered drivers involved in an accident. However, motorcycles are not considered “motor vehicles” under the no-fault law, and riders aren’t entitled to benefits under the law. However, motorcyclists are not required to meet the no-fault law’s “serious injury” threshold to file a legal claim. This means that that they can sue an at-fault driver in court to recover the full amount of their damages even if the injury does not fall within one of the seven categories of “serious injury” under New York law. If you’ve been hurt in a motorcycle accident in New York, get help recovering the money you’re owed for your injuries by contacting the knowledgeable and seasoned Hudson Valley personal injury lawyers at Rusk, Wadlin, Heppner & Martuscello, LLP for assistance with your claim at 845-331-4100 (Kingston), or 845-236-4411 (Marlboro).